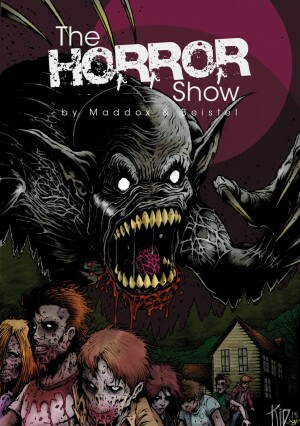 The Horror Show has a trade paperback cover by Mark Kidwell (’68 ZOMBIE COMIC) and colors by Justin Stewart! Bask in its terrifying glory! Todd and I are really excited to have the book collected, and to have Mark’s amazing take on our monster for the cover. The initial release will be available during Tricon Columbus exclusively at the Broken Icon Comics booths, then out for a wider release directly after, so come and celebrate comics with us on August 22 and grab a copy!